Someone once said that there are no cameras for the second place, because the second is deemed unimportant – that is the accepted norm. Only the winner is focused ‘live’ or for the very next edition. May be this is common for any activity in the modern global village. In spite of the above, the situation is real and impacting; no one has the right or the moral right to reverse the decision of a contest by fraudulent means, and if this happens, sometimes the consequences also may be grave. At the same time we all are taught from a very tender age that you have to live by the accepted norms. At home parents’ word is law. In schools the teacher’s word is law. In the team the coach is law and when it comes to the game, the umpire or the referee is law. These are undeniable standards that have been inculcated in us through history. The law is law — either you accept it or face the consequences. However, at the same time there are some new tricks that have infiltrated into the modern society and they challenge the age old traditions. These tricks have devalued the entire gamut of things. Take cricket for instance. The entire cricketing world is rather wary of illegal bowling actions, especially when the guard dog of international cricket, the ICC, takes a very dim view of it. In keeping with ICC’s required standards, Sri Lanka too put systems in place to discourage the bend-arm disease. There were umpteen numbers of bowlers who were screened and the authorities have even gone to the extent of axing them from age-group international tours, but, the school authorities still keep picking them at inter-school matches. Standards to curb illegal action are set in place because the authorities feel that if someone employs an illegal action he has an undue advantage over the rest of the participants. So, it is discouraged. Yet, if a school authority still chooses the player there is something amiss. At one end someone is gaining by this move deviously. Maybe the bowler in question bags a lot of wickets at school level and helps win matches. This ensures the coach his job. He would not be axed for the next season because he has produced the desired results. But, what would the cricketer in question gain? Nothing. Once the bowler in question moves into the higher level, the club system will not accept him, because his bowling action is suspect. For the club, a bowler with a bent arm is of no use. At the same time, the cricketer has wasted a good portion of his youth for no avail; once he finishes his school career, automatically his cricket season also would be over. The result – another disgruntled element added to society. That is one side of the story. The other disturbing factor that is commonplace in school sport is violence or unbecoming behaviour. It was not so long ago even some members of the Under 19 national squad faced bans by the Sri Lanka School Cricket Association for unbecoming behaviour. But, alas the ultimate result was hilarious. The Sri Lanka School Cricket Association or the School Authority itself failed to implement disciplinary measures in a proper manner and the players concerned got off only with a whimper. The next is violence at school rugby. This is also a very serious problem. Now it is so common that it happens almost after every school rugby encounter. 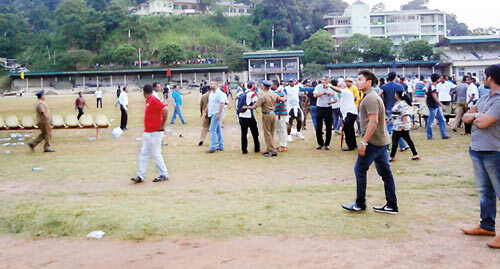 It was only month that hell broke loose in the aftermath of the Bradby Shield second leg when the two schools failed to agree upon as to who should have the custody of the shield. 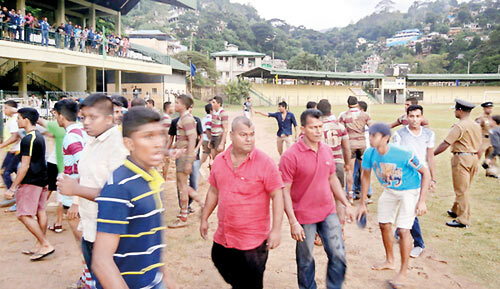 Besides this, there were several other skirmishes at other school matches, but, the next head basher came at the Bogambara Stadium last Saturday during the School Rugby Plate decider between St. Joseph’s and Dharmaraja. Rugby wise what transpired is accepted. Someone has to win and there is no camera for the second place. But, wanton violence is not acceptable at any count. At all costs rugby violence should be eradicated and abhorred. Some try to explain that it is the rugby referee that should be taken to task because the refereeing standards have plummeted. Our argument is if the refereeing is bad, they should deal with that problem at a different level, but, the students should get the message that violence is not condoned. As a result of occurrences of this nature, at the end of the day you add another misguided and confused youth to society with false values. 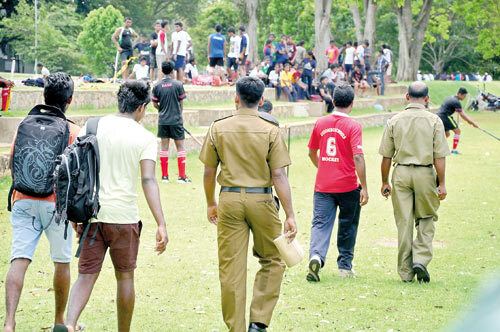 The Sunday Musings asked how the newly appointed Education Department Sports Consultant Sunil Jayaweera would see this situation, especially the school rugby violence. He is indeed much perturbed by the situation. Jayaweera explained, “This is unacceptable. He said that he is not hoping to put the onus of the law and order on Police. “It is the respective school authorities who will be responsible and they would have to organise crowd control measures.” Jayaweera explained that some years ago when he was Education Department director in charge of sports, he took steps to ban Isipathana for the same reason. 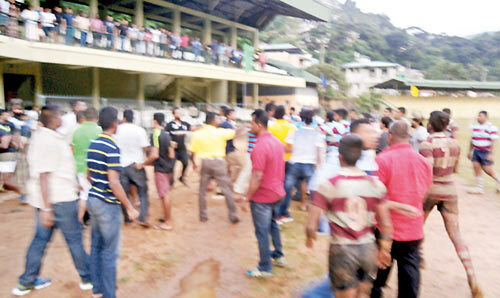 “Now an inquiry is going on regarding the Bradby Shield incident. The Royal principal came forward and gave his statement, but, the Trinity principal refused to give a statement, but, handed over a report compiled him. “School authorities should pay more attention to this unacceptable situation and the schools which get involved are unfortunately the best of schools. This creates a bad precedent. What would children from smaller schools learn? They would try to emulate the bad behaviour of boys of big schools. ”Yes, there are drastic measures like barring the spectators from matches or asking the authorities to raise the ticket fare at school rugger matches. But, would that solve the problem? “What I say is if the situation could not be controlled, we should stop schools’ rugby. At the same time I hope a situation of that nature would not arise for the betterment for the sport and the children who get involved in it”.